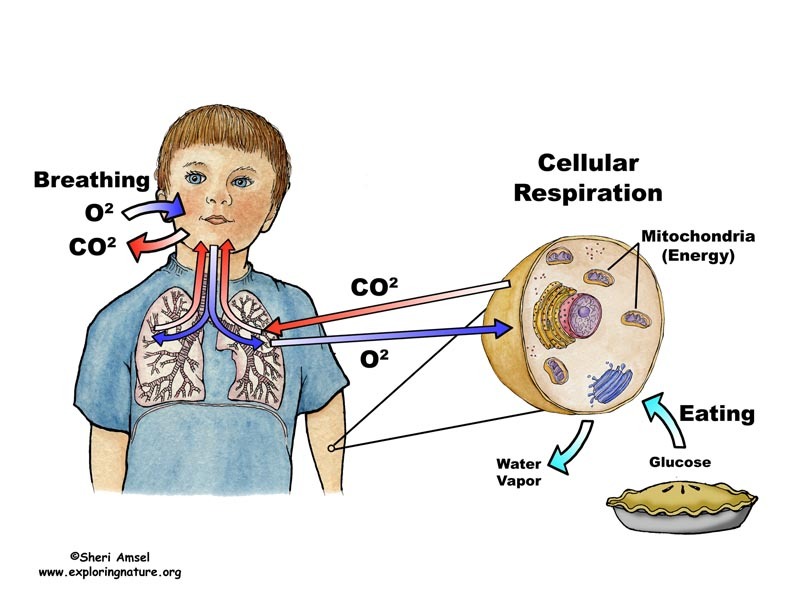 1) What is cellular respiration? 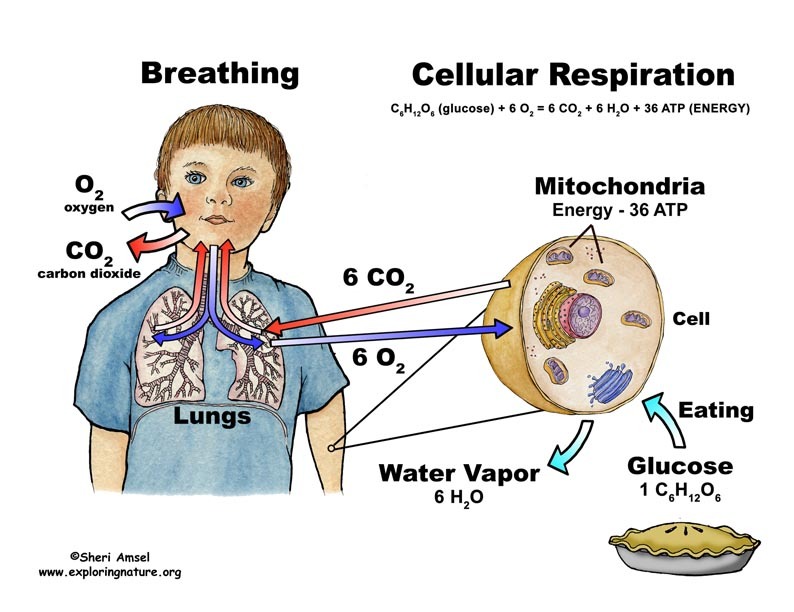 2) How is cellular respiration connected to breathing? 3) If you are an athlete that exercises extensively, what organelles might you expect to see more of in your cells? 4) How does eating food give our cells energy? When we eat and digest food, it is broken down into smaller and smaller units until it becomes small enough to be used in our cells as glucose molecules. At the same time, we are breathing in oxygen that travels from our lungs through our bloodstream into smaller and smaller blood vessels until it reaches our cells. When the glucose and oxygen reach our cells, we have the materials we need to perform cellular respiration. This process starts in the cells’ cytoplasm and is completed in the mitochondria - the cellular powerhouse. In those tiny organelles, one molecule of glucose with 6 molecules of oxygen are changed into 36 molecules of ATP – the energy cells can use to get things done. 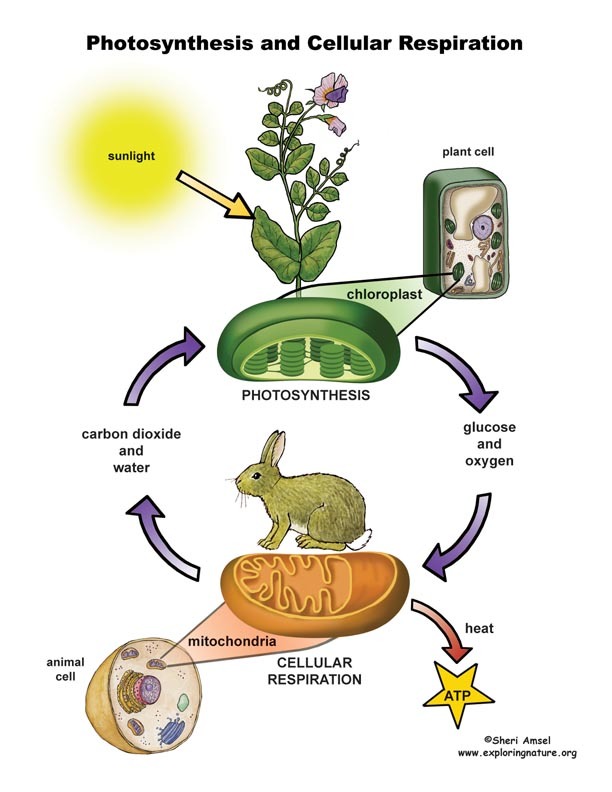 Cellular respiration is going on in every cell in both animals and plants. 4) glucose molecules (plus oxygen from breathing) are converted in the cells to energy (ATP). Cellular respiration (a three stage process) converts glucose and oxygen to ATP (the cellular form of energy) and releases carbon dioxide and water. This is cellular respiration. Note that: 1 molecule of glucose plus 6 molecules of oxygen are changed into about 36 molecules of ATP (energy) plus 6 molecules of water and 6 molecules of carbon dioxide during cellular respiration. 5) provides carbohydrates to animals for their cellular respiration. The cycle continues. For what do we use ATP? ATP is the energy that cells use to do their work. This, in turn, helps the body run smoothly and do its work like: breathe, circulate blood, digest, respond to stimuli, create new cells, repair and grow, move our muscles, etc. Everything you do uses energy. So now we know that cellular respiration is a three stage process that converts glucose and oxygen to ATP and releases carbon dioxide and water. What are the 3 phases that do this? Glycolysis is the process where 1 glucose molecule in the cell’s cytoplasm is broken down (through several steps) into 2 molecules of pyruvate, which is then used in the Kreb’s Cycle (stage 2). This break down also releases 2 ATP + 2 H2O + 2 NADH molecules. To start the Krebs Cycle, pyruvate is pulled into the cell’s mitochondria and converted to Acetyl-CoA. The Acetyl-CoA molecule is then converted (through several steps and two complete turns of the Kreb’s Cycle) into 4 CO2 molecules, 6 NADH molecules, 2 ATP molecules and 2 FADH2 molecules. The final stage – the Electron Transport Chain (ETC) is found in the mitochondria (in animals) and in the chloroplasts (in plants) and releases 32-34 ATP molecules when the electron transport chain produces a concentration gradient through which hydrogen moves across the membrane releasing energy as ATP (produced via the proton motive force). As we saw, cellular respiration needs oxygen to progress. What happens if there is no oxygen where an organism lives (anaerobic conditions)? In that case, the organism can still create energy, but through the process of fermentation. Fermentation happens in the cells’ cytoplasm (not in the mitochondria) and helps generate only 2 ATP molecules per glucose molecule (much less effective in generating energy than cellular respiration). Fermentation uses the pyruvate molecules made by glycolysis from glucose. In the making of wine and beer (alcohol), yeast cells generate ATP by the fermentation of the sugars in fruit and grain (in the absence of oxygen). Yeast can also release carbon dioxide in this process, which is what causes bread to rise. In animals, the lack of oxygen will drive muscle cells to carry on lactate fermentation which creates lactic acid causing sore and cramping muscles. This happens when you get so much exercise (say on a very long hike or run) so that your body runs low on oxygen for cellular respiration. Here are three visual depictions of cellular respiration – an equation, an output description and an illustration.